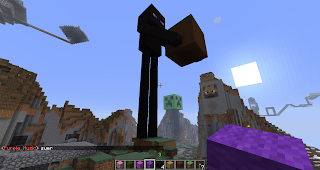 Minecraft Blog: Giant Enderman on Minecraft Blogger Server: So I've been chilling out with the guys over in the Minecraft Blogger server helping out with the titanic epic build, of course I've been in creative mode to do this and so when not helping with that build I've been cleaning up any griefing and building other cool things. To welcome new users of the server at spawn I thought be good idea to shock them with a giant enderman. don't look at him for to long you'll get vertigo and don't leave your cakes lying about.